In a perch high above Lincoln Park lives a whimsical man devoted to the illusion of impossibility, a showman whose nimble mind and agile fingers can make boring decks of cards jump to life--just like magic. 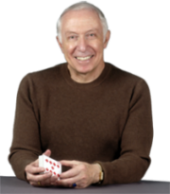 His name is Simon Aronson, anonymous to the masses even though he has been a veritable magic trick incubator for decades, publishing books on card magic, creating countless tricks and maintaining Chicago's little-known tradition as a hub for card-trick innovation. To meet the 59-year-old, to learn of his longtime career as a corporate attorney in the Loop, his sophisticated love of art and ballroom dancing, one would never peg him a luminary in the often-wacky world of magic wands and top hats. That's fitting. If there's one thing Aronson has always been good at--at least since his first magic show at age 11--it's fooling people. "The opposite of illusion is really disillusionment, and who would want that?" Aronson said, a deck of cards, as always, fluttering from hand to hand. "If the illusion is fun, why not revel in it?" As an amateur magician--one who doesn't perform on stage or wander bars entertaining revelers--Aronson is part of the international brain trust behind modern-day magic. Professional magicians, in most cases, don't have the time to develop new tricks, but rather focus on perfecting existing ones. They rely primarily on those who make magic a hobby, people like Aronson who can spend countless hours developing the schemes and sleights of hand and clever patter that make magic come to life. 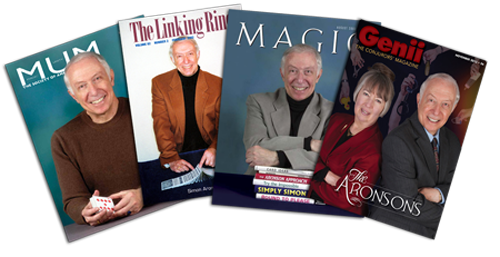 "The amateurs in magic are where the art gets a lot of its ideas and creations, because these guys have time to sit around and invent," said John Moehring, editor of MAGIC, an industry magazine. "Simon is definitely a big part of that. The pros end up using his material mainly because he's invested the time and creative talent to come forward with something that the guys out there don't have time to piddle with." Chicago's biggest claim to fame in the world of magic is, appropriately enough, bar magic. In the 1940s and 1950s, in a city generously endowed with watering holes, magicians first started doing bar-top tricks or roaming from table to table, a concept that quickly spread to cities across the country. 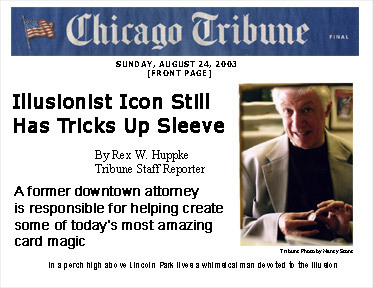 But Chicago has also long been an integral contributor to the world of card magic, thanks in large part to Aronson's primary inspiration, Ed Marlo, a tool and die worker by trade who was revered in magic circles as one of the all-time masters of card tricks. Aronson--whose love for magic began at age 8 in Rye, N.Y., with a Mandrake the Magician magic set--was doing magic to pay his way through the University of Chicago in the late 1960s when he first met Marlo. Already adept at playing-card tricks, Aronson was invited in 1969 to join Marlo and other top magicians at the weekly "sessions" that Marlo ran. Sessions are an almost sacred ritual in which magicians share tricks of their trade, bounce ideas off each other, seek advice and constantly try to fool each other, knowing their colleagues would never reveal secrets to the public. "The secrecy part is what is really unique about magic," Aronson said. "We trust each other. We work, we show, we fool, we help tweak each other's tricks." People would come from all over the world to sessions with Marlo, and Aronson was there nearly every Saturday until Marlo died in 1991. "He was possibly the greatest magician of the last century," Aronson said. After Marlo died, Aronson took over the Saturday sessions and moved them to the kitchen table in his 29th floor condominium in Lincoln Park, ensuring that Chicago would remain a vibrant source of card trick creativity. Aronson's card tricks often take years to perfect. He's a student of his art, spending hours a day breaking down the old secrets of the "pick a card, any card" genre and rebuilding them to his liking. In a trick he calls Fate, Aronson shows a full deck of cards, shuffles them and tells a person to think of their birth date while they pick a card. The person can't look at the card and is instructed to place it in an envelope. Aronson then brings out a chart that matches different cards to dates of birth. Once the person finds the card associated with their birth date, Aronson recites his well-practiced patter, makes a few quips and then has the subject open the envelope. Voila. It's the card matching the birth date, a card, Aronson says, the person was destined to pick. "Simon is an innovator, he's very meticulous about everything," said Jim Krzak, a professional magician who performs regularly at Chicago bars and restaurants. "Everything he does has to have a purpose." While working typically wild hours as an attorney, Aronson managed to publish five books on card magic, a sixth coming out shortly after he retired. Throughout his career in real estate law at Lord, Bissell & Brook, he was rarely seen without a deck of cards, or a coin between his fingers that would alternately appear and disappear. He'd put business calls on speakerphone to free his hands to shuffle or practice sleight-of-hand techniques, and he'd try new tricks out on everyone: law partners, mail clerks, clients. "I enjoyed the practice of law, but it wasn't my highest priority," said Aronson, who retired in 1999 at age 55. "Law has a certain sense of propriety. Magic and entertainers inherently break that down. I always wanted to play." And play he did. Larry Gray, who still works at the firm, said Aronson was one of the brightest lawyers he's ever known, but he recalls seeing the hobbyist magician break out card tricks after completing big real-estate deals, or using magic to break the ice with new clients. "I always had this scheme where I would go to a friendly poker game with Simon and just clean up for a night," Gray said. "But he always said, `No I can't do that, I can't do that." Not that Aronson is opposed to deception. When he met his wife, Ginny, while they were both at the U. of C., he asked her to become his partner in a mind-reading act that he'd spent years refining. The couple performed at nightclubs and private parties across Chicago from the late 1960s to the mid-1970s, taking them into their early years as attorneys. In the act, a blindfolded Ginny Aronson sits facing away from her audience. Aronson walks among the crowd and gets people to take items out of their pockets or wallets. He has them hold the items in their hand, and Ginny miraculously identifies them. One of the more spectacular nuances is her ability to recite, still blindfolded, the serial number off any random dollar bill. "That's probably among the top acts of its kind in the world," said Chicago magician John Bannon. And unlike many of Aronson's published card tricks, the method behind the mind-reading routine remains a secret. When Aronson ended his legal career, he decided he wanted the mind-reading trick to be his grand finale. A typical retirement party for a law partner would be filled with droll but complimentary speeches. Aronson insisted that there be no speeches, just a chance to read the minds of about 80 normally staid law partners. Gray admitted it was an unusual moment in the world of high-powered law, but the act went off like a charm. "There are some things they did that you just couldn't believe," he said. "People who hadn't seen things he does in the past, they were just amazed." And that is all Aronson has ever wanted--to amaze people, to make them believe the impossible is happening before their eyes. "It's a whimsy, it's a sense of fantasy, it's a relief," he said, his showman grin dissolving into a sincere smile. "You're relieved from the constraints of reality and the constraints of our world that limit us and tell us what we can and can't do. "Magic," he said, shuffling his deck with one hand, "is a way of not growing up."